Can the tech industry solve the employee tenure problem? Most tech companies don’t perceive employee tenure to be a problem yet. 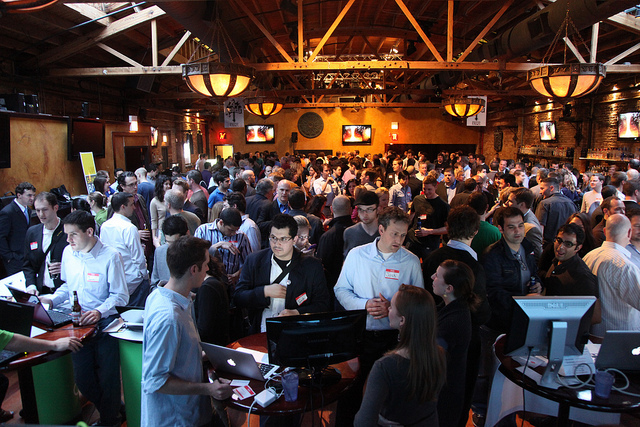 The industry is booming and jobs in this sector keep multiplying by the minute. The downside to all this, however, is that the tech industry has one of the lowest employee tenure averages registered in the past few years. The fact is our mentalities have drastically changed over the last decade. From baby boomer’s 10 years tenure outlook to an average of 5 years now, everything changes, especially the rules of HR. “It used to be that when you were looking at someone’s resume and they changed jobs more frequently than every five to seven years, they’d be labeled as a job hopper, unstable, greedy or selfish, unable to hold a job. Whatever it was, it usually flagged them and pulled them out of the stack. Employee tenure is the length of time that a person spends with the same employer. Tenure is affected by changes in demographics, technology and the state of the economy. The general tendency, as workers advance in age, is for tenure to rise and then decrease around retirement age. Employee tenure usually increases during recession. Women’s enlarged participation in the workforce has significantly balanced gender employee tenure over the past decades. A higher degree in education usually leads to a bigger employee tenure. Employee tenure is lowest in the service industry. According to SHRM’s assessment on employee tenure between 2012-2013, the service industry has a 5 year average, which is the lowest average registered. Employees in this industry do not stay at their organizations particularly long and seem to have little connection to or investment in their jobs. For tech companies, talent retention is even more volatile, the average employee tenure being estimated at around 3 years. Employee turnover is a costly issue. With every employee leaving, a company loses both its financial investment in recruitment, onboarding and training costs, as well as its non-financial investment (that can sometimes weigh harder) in knowledge, workplace collaboration and competitiveness. Businesses are just coming to realize that and, hopefully, are coming up with ways to address this challenge. PayScale did a survey to identify US companies with the highest and lowest employee tenure, out of the Fortune 500 list. The overall average that they came up with was 3.68 years. Compared to the US Bureau of Labor Statistics’ report released in January of 2012, the average dropped with 1 year, from 4.6 years. At least that’s what I thought. But it turns out that great companies don’t necessarily inspire employee loyalty. For Amazon, this ranking was quite an image hit. Headlines like “Amazon’s Stressed Out Culture Is Burning Out Employees”, “Amazon employees rank as second least loyal” or “Bezos rules Amazon employees with ice water in his veins” were in the top search results for “Amazon”. Well-known for its efficiency, the company quickly turned the tables on their public image, offering to pay $5.000 to employees who want to quit. Still, their Glassdoor profile still ranked them 3.3 out of 5 with 3.017 reviews and an 85% approval rate for CEO Jeff Bezos. We recently talked about employee advocacy and the power of “Would you recommend this company to a friend?”. Well, Amazon’s recommendation percentage is a mere 64%, employees constantly emphasizing on work-related stress and the lack of a work-life balance. Google, on the other hand, is represented in popular online articles as the Nirvana of technology workplaces: free five-star food, five months of paid maternity leave, great insurance, free yoga, kindergartens and gyms at the workplace, the freedom to work on one’s own projects 20 percent of the time and even death benefits. But it seems perks are not enough to buy employee loyalty and long-term commitment. Their employee tenure average: 1.1, just 0.1 over Amazon. Economists are speculating that the main reason for this low tenure rate is the recent hiring spree, that brought on new, younger talent, placing the company average age at 29. It seems that the UK is also struggling with this issue. The CIPD Megatrends Report revealed that the employee tenure average in the UK is the lowest one in all the OECD countries (The Organisation for Economic Co-operation and Development), at approximately 1.6 years. According to this report, analysts believe that young people are much more likely to change jobs. It’s also implied that they are less likely to remain in their jobs over any given period than older age groups. The tech industry seems to be doing better in the UK compared to the US but I don’t think it’s going to stay that way for too long. London’s tech industry is expected to pump £12 billion into their economy over next ten years. That means 46,000 jobs by 2024. If they want to rival and even surpass Silicon Valley, tech companies in the UK should also be mindful of the matching HR challenges ahead, especially employee tenure. Is it the economy? Gen Y? The industry itself? It’s almost impossible to separate all the determining factors and assign percentages. More so, the way in which they interact is also hard to accurately pin down. To see how people analytics can be used to create engaging employee experiences that foster retention, download our free white paper. But let’s talk about some of the main elements influencing employee tenure. We know that the aging population is a significant element. Baby boomers are leaving the job market, soon to be followed by gen X and the independent, tech-savvy Millennials are entering the workplace. In the US, median tenure has trended up since 2000, when it was 3.5 years, to 4.6 in 2012.The long-term rise in tenure reflects, in part, the aging of the workforce. In 2012, the median age of employed persons was 42.3 years, up from 39.4 years in 2000. Europe, particularly Western Europe, is also struggling with an increasingly high number of aged workers and is trying to balance the job market and encourage natality. Sometimes in very creative ways like this `Do it for Denmark` ad. On the other hand, there are a lot of fingers pointed at gen Y as a main reason for the decrease in employee tenure. The so-called “job hoppers” are making their own rules in the workplace. They involve much more flexibility, mobility and autonomy than ever before. The average estimated job tenure for Gen Y is 2 years. Dan Schawbel explains some of the reasons why employers are experiencing employee retention problems with this new generation. As for the industry itself, tech really is booming right now. Skilled employees in this industry are valuable and they know it. That gives them a lot of leverage. It also encourages very high salaries and a constant risk of a better offer coming along. All of these factors are strongly connected and they reflect the society we live in. It’s important that companies understand them and design smart, long-term HR strategies to keep driving performance. If you’re a small or medium business, chances are you haven’t given much thought or resources to determine your employee tenure. 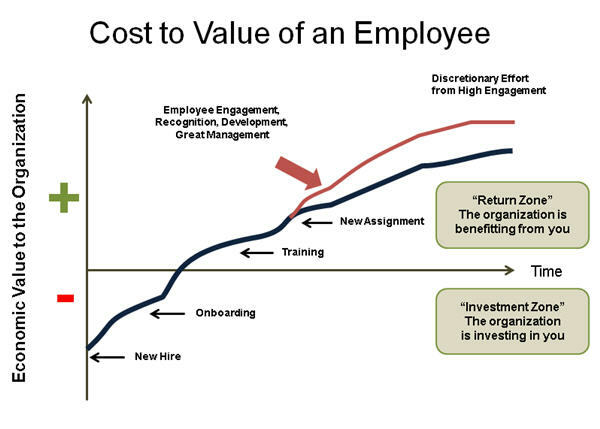 This graph on the cost and value of an employee makes it really easy to understand why employee engagement is key to retaining your talent and gaining real value from it. Employee engagement is usually tracked and measured through online surveys, paper-based surveys, focus groups, one-on-one meetings or other tech tools. In one of our recent posts we went further into this subject and explained how you can integrate employee engagement in your HR strategy. If you want your employees to stay long enough to return the value you invested in them, you need to provide value as well. Not just in financial compensation and benefits. 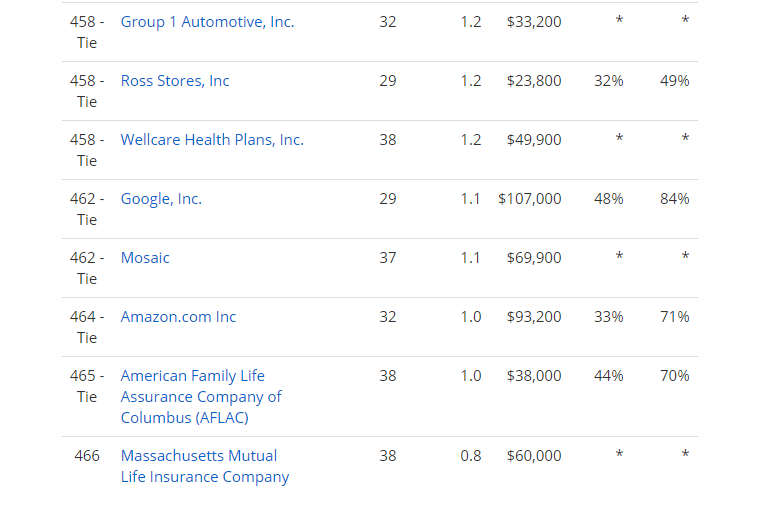 Pay is, after all, no.3 in the top ten engagement drivers. Meaning is no.1. Employees crave meaning in their activity, in their work environment and in the relationships they form with the people at work. They want to know the “why” of every work effort and it has to be worth it. Your company has to make it all worthwhile. Company culture is just that. It’s the driving force for meaning and workplace satisfaction. Synergis Technologies’ 108 employees have been with the organization for an average of 10 years. The company was recently featured in this article in Business Management Daily, proving that company culture really is key to employee loyalty and employee engagement. CEO David Sharp III attributes employee longevity to the organization’s culture. Their core values (family spirit and unity, innovation, service beyond expectation, an extraordinary workplace environment, personal growth and giving back to its communities) make employees feel connected and truly appreciated. It makes them find meaning in their work. Employee tenure may not seem like a hot topic but it’s an essential metric in understanding and leveraging long-term trends in the labor market. Across the world, employee tenure has been decreasing with every year due to several factors such as demographics, socio-economic trends or industry trends. The tech industry has one of the lowest employee tenure mainly because it’s been growing at a fast pace, especially now that the recession seems to be behind us. It’s also the industry of choice for gen Y, who are well known for their eagerness to learn as much as possible and as fast as possible, from more than one company. We’ve pointed out some key actions that your company can take to address a low employee tenure. Check back in with us and let us know if any of these ideas were helpful and how!